• Briefly blitz the flour, butter and salt in a food processor until it gets all crumbly. • Add the iced water and blitz again until the dough comes together in a big lump (if it doesn’t come together quickly, add a tiny bit more water). • Take the dough out of the food processor and cut in half to check if the butter and flour are evenly blended. If not, give it a quick knead. • Wrap in cling film and leave to rest in the fridge for at least 45 minutes. • Add the flour and salt in a big bowl and scatter the cubed butter on top. • Using a fork, squash down the butter into the flour until you have even crumbs. • Add the iced water and try to combine with the fork for as long as possible. • Finally, bring everything together by quickly kneading it with one hand. • Cut in half to check if the butter and flour are evenly blended. Tip: Based on the high butter content, try to knead the dough as little as possible by hand as the warmth will soften the butter and make it difficult to handle. 1. While the pastry is in the fridge, peel, quarter, core, and cut the apples into not too thin slices. 2. Put in a bowl and add the lemon zest and juice to stop the apples from browning. 3. Add the sugar, cinnamon, corn flour, and vanilla and combine evenly by hand. Put aside. 4. Butter the wall of the Springform and put some grease proof paper on the bottom. 5. Preheat the oven to 200ºC/180ºC fan oven or 392ºF/356ºC fan oven. 6. Take the pastry out of the fridge and cut 2/3 off. Wrap the other third in cling film and return to the fridge until needed for the cover. 7. Quickly knead the dough to slightly soften it but don’t warm it too much as it will get soft and become hard to handle. 8. Cut two large pieces off cling film and place on a clean surface, overlapping slightly to make it bigger. 9. Put the dough in the middle of the evenly spread cling film and repeat as above, adding another two pieces on top. Now the dough won’t stick to the surface or rolling pin, making it easier to handle. 10. Roll the dough out thinly in a circle of approx. 3mm thickness, until it’s big enough to cover the bottom and sides of theSpringform, hanging out a bit on the side. 11. Remove the top half of the cling film, lift the Springform to an angle and flip over the rolled-out pastry into it. 12. Slowly pull off the remaining cling film and gently pat the dough into the form, making sure it covers the floor and walls evenly. 13. As the dough has a high butter content it won’t stick to the wall. If it rips or is too thick, just gently push it back together or thin out the thick areas. 14. Prick the bottom with a fork. 15. Give the apples a good mix and add half to the Springform. 16. Sprinkle over the raisins (ignore this step if you’re not using them). 17. Add the remaining apples and gently tap the Springform against your work surface, ensuring the apples spread evenly. 18. Cut off any overlapping dough and add to the remains in the fridge. 19. Repeat steps 7-12 for the pie cover (remember you don’t need to roll it as big as the bottom half). 20. Once you’ve placed the cover on top of the apples, pinch the edges together and cut off any leftovers. 21. If you have any pastry left, make a mesh or any other decoration you fancy but this is not necessary. 22. Make a small hole at the top so the hot air can escape, ensuring the apple pie doesn’t crack. 23. Place the pie in the bottom half of your oven and bake for one hour. 24. If the pastry is browning too quickly, place some baking paper on top to stop it from burning. 25. During the last 10 minutes of baking, heat the apricot jam in a pan until it gets liquid and whizz with a hand blender until all lumps and bumps are removed and you’ve got a silky, smooth apricot glaze. Alternatively, smooth the runny jam through a sieve and discard any skins and lumps. 26. Place the baked apple pie on a cooling rack and immediately, while still hot, spread the apricot glaze all over. 27. Let it cool down completely, ideally over night, before removing the Springform rim. 28. Slowly and gently open the Springform. Don’t try ripping it off the pie as some of the apple filling might have escaped and got stuck to the rim, tearing the pie apart (done it before…). 29. Gently cut around the rim with a thin, sharp knife and then remove it. 30. Mix up the lemon and icing sugar and either pour over the glaze or the sides. 31. Once the sugar icing has dried, slowly slide the pie onto a cake plate and serve on its own or with some whipped cream or vanilla ice cream. 32. 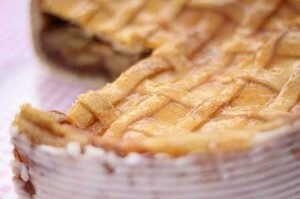 The Apple Pie keeps for 3-5 days in the fridge, but will lose its crunch over time.